Color is in this season! Bold bright prints are coming our way, and after this long gray winter – I’m ready for the kind of color that really packs a punch! 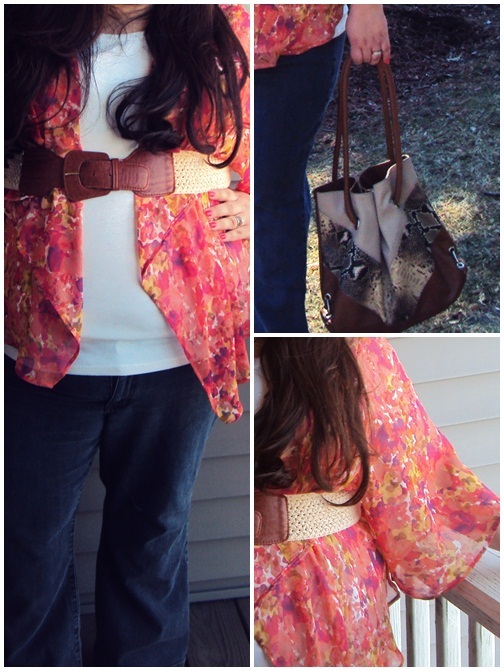 That’s why I chose this vibrant chiffon floral cardigan from apt. 9 as my inspiration for my Kohl’s spring bold look. This cardigan is the perfect little shot of fun and adds just the right amount of color to my wardrobe. To complete the look, I paired it with a simple Croft & Barrow tee, a gorgeous Daisy Fuentes Adrian python tote, and because a belt is a curvy girl’s best friend – I cinched it at the waist. Cute, right? It almost makes me forget I was standing in freezing 30 degree weather, but what can I say- I love putting on bright prints, as much as I love shopping at Kohl’s. They have an amazing selection of brands like Simply Vera Vera Wang, Jennifer Lopez Collection, Rock & Republic, Elle, and LC Lauren Conrad just to name a few. It’s no wonder I’ve been a loyal customer of theirs for years! I love shopping there. They’ve got great prices, awesome sales, and an extensive selection for every size. If you haven’t shopped there – you need to STAT! I love the bright and bold trend too. Love the color of the cardigan! Thanks. It's all about bold right now! Love that bright color! Kohl's is one of my favorite stores. Me too! I have to shop there about every month. Thanks. Yes, they have amazing brands and even better prices! Excellent choice! That cardi is lovely!